[News from the News Center] On Apr. 3, guided by China Engineering Education Accreditation Association, the Q&A symposium for 2019 China Engineering Education Accreditation hosted by YSU was held at the Student Center, West Campus. Vice President Zhao Yongsheng attended the meeting and delivered a speech on behalf of YSU. Many famous experts attended the meeting such as Liu Zhijun, Du Dong, Hu Hongying, Dong Dawei, BaoNengsheng, Wang Zhenlin and Tang Xuhua, as well as more than 140 teachers from more than 50 universities and colleges in China. The meeting was presided over by Ye Jinrui, deputy director at the certification office of the Higher Education Evaluation Center of the Ministry of Education. In his speech, Zhao Yongsheng warmly welcomed the experts and representatives, and introduced the basic situation of YSU and our efforts and support for the accreditation. He mentioned that YSU attached great importance to the engineering education accreditation, and regarded it as an important point for promoting teaching reform and strengthening discipline construction. YSU has implemented a comprehensive reform of the talent cultivation model based on the OBE education concept within the whole university, reorganized the training objectives and graduation requirements, and developed talent cultivation in accordance with the accreditation standards. YSU encourages engineering majors to participate in the accreditation, and strengthen the construction, improvement and evaluation of the accredited majors, forming a good atmosphere for the related work. Since 2011, YSU’s 10 engineering majors have passed the accreditation. Finally, he stressed that YSU would provide a platform for the exchange of experience in the engineering education accreditation, and continuously contribute to the development of national engineering education. This meeting was divided into two parts. 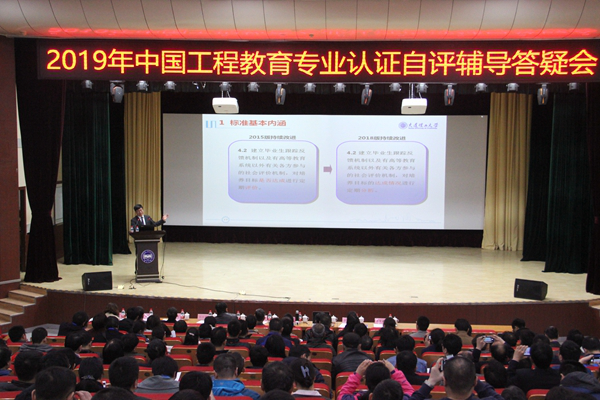 At the first part in the morning, Prof. Liu Zhijun, director of the Academic Affairs Office of Dalian University of Technology, delivered a guidance report entitled “understanding the requirements of the engineering education accreditation and establishing a normal mechanism of self-evaluation”. He gave an accurate interpretation of the accreditation standards, and conducted an in-depth analysis of how to effectively carry out the self-evaluation and establish its normal mechanism. Afterwards, six experts answered the questions proposed by the participating representatives in the accreditation such as the non-technical ability training, the achievement evaluation of graduation requirements, and the assessment of the curriculum. At the second part in the afternoon, four parallel sessions were set for questioning and answering in groups, and seven experts discussed and exchanged face-to-face with the representatives. The meeting aims to answer the questions in the accreditation for domestic colleges and universities, which has of great active influence for conducting the exchanges with relevant universities and colleges and promoting in-depth accreditation of YSU.